Fennel is often classified as both an herb and a vegetable and can be used in many ways in the kitchen. It's also a popular plant among herbalists and has been used for thousands of years as a natural remedy, most commonly for digestive problems. Fennel has a wonderful anise flavor that works well in both savory and sweet recipes. It's a popular ingredient in Mediterranean cuisine. The bulbs are commonly roasted or grilled or added, raw, to salads, and the feathery fronds can be added to salads and soups to impart a more delicate fennel flavor. There are two types of fennel that you may want to grow in your garden, depending on how you plan to use it. 'Florence Fennel' is used more like a vegetable and is grown for its bulbous stem. "Herb fennel," doesn't really produce much of a bulb, and it is typically grown for its foliage and used as an herb. Fennel should be grown in full sun, in fertile, well-drained soil. It should not be planted in the same area as dill or coriander because they will cross-pollinate easily and seed production will be reduced. Fennel self-sows easily, so it's likely that if you plant it once, you'll see fennel popping up in your garden each spring thereafter. Fennel is a perennial but is grown as an annual in northern climates. Treat it as an annual if winter temperatures in your area regularly fall below fifteen degrees Fahrenheit. You can also easily grow fennel in containers. Just be sure to plant in containers that are at least ten inches deep. 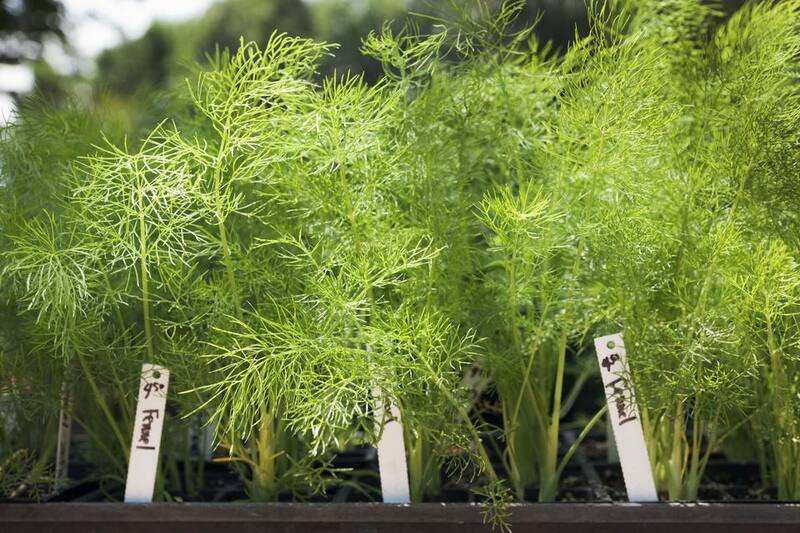 Fennel can grow up to five feet tall, depending on which variety you're growing. Be sure to take its eventual size into account at planting time so it doesn't shade the rest of your vegetables. Also, it can inhibit the growth of tomatoes and beans, according to several sources, so you may want to avoid planting them near either of those crops. You can direct sow fennel seeds in your garden near your last spring frost date. Seeds should be planted ten to twelve inches apart and will germinate in eight to twelve days. You can also sow the seeds indoors, under lights, about four weeks before your last frost date, then harden them off and transplant them into your garden. Fennel rarely suffers from any problems. Aphids can sometimes be an issue. You can harvest fennel leaves as needed for fresh use. The seeds can be harvested when ripe, in late summer or early fall. The easiest way to harvest fennel seeds is to shake the seed heads over a sheet or tarp to collect the seeds. Let the seeds dry well before storing them in a cool, dark place. Florence fennel can be harvested as soon as the base of the stem becomes swollen. Pull plants up as needed, and harvest any that are left in the ground at the end of the season before the first fall frost. This is the type of fennel to grow if you want to harvest the bulbous stems to use as a vegetable. The leaves and seeds of this variety are also edible, so you get three uses in one plant. Solaris produces large semi-flat bulbs that are resistant to bolting. Zefa fino is ready for harvest in 80 days, bolt resistant and very large. Orion is ready to harvest in 80 days and has large, thick, rounded bulbs with a crisp texture.